This uncultivated wild rice will be hand-harvest for you. 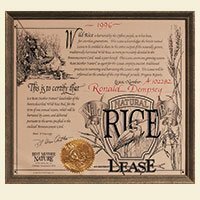 This wild rice lease is the most unique gift I have ever been able to send anyone – and was recognized as such by my friends and relatives. There’s a fascinating story behind this rice – and you can’t get it anywhere else. Great gift for foodies who have everything! And a chance to give back in a small way to the original people of our country. Last year I sent a Rent Mother Nature lease to everyone on my holiday list and every single one of them reported how much they enjoyed the produce. Wild rice was a real taste treat. Your recipe suggestions were very helpful. Everything was wonderful! We got many thanks from our friends, but you deserve the credit. Please never drop the wild rice lease. I can’t find that rice anywhere. It’s been the mainstay of my Monday nite comfort food for a number of years Thanks again.